ITIL Service level management is an important part of the ITIL service management framework. According to ITIL Foundation certification training, ITIL service level management (SLM) is part of the ITIL Service Design stage of the ITIL lifecycle for services. There are several aspects that are in scope of SLM. ITIL Service level management is a collaborative effort between the business, the IT department, external parties and internal parties. Without collaboration, ITIL service level management simply would not work. ITIL Service level management relies strongly on invested stakeholders from all parties who are on board with collaborating with each other. Online ITIL courses tell us that the fundamental scope of the ITIL service level management process is that the process represents the link between the IT service provider and the business. The business will try to generate attractive goods and services for its end customers to ensure a sustainable business and to create revenue. These business objectives will require new IT services to be planned, designed, implemented and deployed. The ITIL service level management process ensures that the agreement between the business and the IT service provider contains what is required by the business and the obligation of the IT service provider against these requirements. Therefore, the ITIL service level management process acts as the link between the business and the IT service provider regarding the expectations of the business and what should be delivered by the IT Service Provider. Without this link, services cannot be effectively designed. 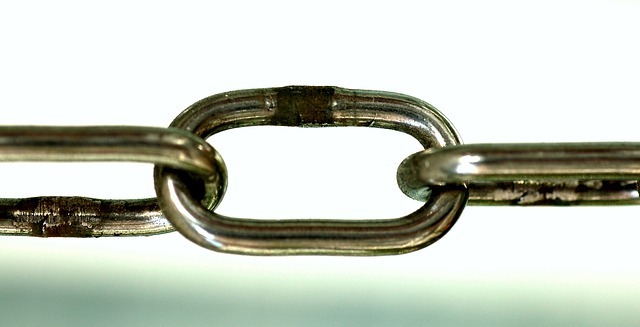 Establishing a link between the business and the IT department is imperative to secure successful services being deployed to the end customer. The ITIL service level management process manages expectations and perception of the business, customers, and users and ensures the compliance with the service quality as well. Based on the expectations of the business and capacities of the IT service provider, a service level agreement will be signed off between the business and IT service provider. In this context, the ITIL service level management process aims to manage the requirements of the business and what should be delivered to the business by the IT Service provider based on the service level agreement. The ITIL service level management process also covers negotiation and arrangement of current requirements and objectives as well as management of service level agreements for all operational services. Business requirements are evaluated by the IT Service provider and the required service delivery quality, capacity, availability etc. are planned by the IT service provider. For instance, the IT service provider can declare that: “We can provide this service to ten million users at maximum, two thousand users concurrently and with 99% availability”. These kinds of negotiations take place in the scope of ITIL Service Level Management process. Similarly, these kinds of service level negotiations take place for all new services as well. ITIL Service level requirements are determined based on the expectations and perception of the business and how each ITIL service level can be reached by the IT Service provider is negotiated and arranged in the scope of the ITIL service level management process for all new services or the services that will be changed. These negotiations are especially important as it involves procuring enough resources to enable the new service to work according to the business requirements. The management of the operational level agreements which are aligned with the service level targets is also within the scope of ITIL service level management processes. An operational level agreement takes place between an IT service provider and another part of the same organization. For instance, if the IT department needs a service from finance department about the balance of a customer, ITIL service level agreements between the IT department and the finance department are called operational level agreements. Since operational level agreements also cover the service level expectations of two parties in an organization, this is under the scope of the ITIL service level management as well. 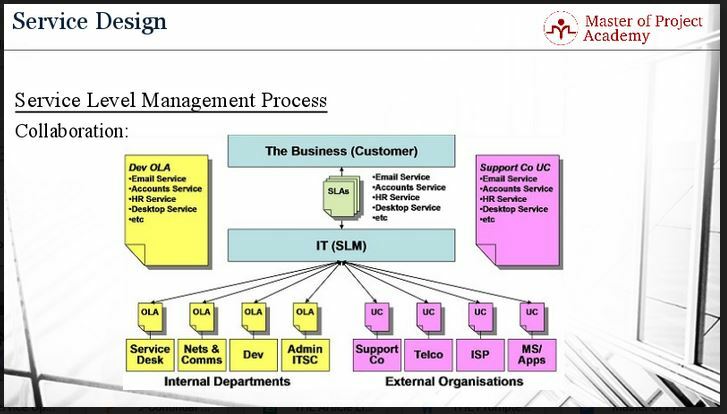 This figure shows the collaboration of the ITIL service level management process with business, internal departments and external organizations. The blue boxes represent the business or customer and the IT Service Provider. Based on the expectations and negotiations between the business and IT Service provider, service level agreements are signed. The yellow boxes in the figure represent the relationship of the IT Service provider with the other departments of the same organization. Operational level agreements are signed between the internal departments and the IT service provider. Finally, the purple boxes in this figure represent the relationship between the IT Service provider and the external organizations. An IT Service provider might require some services from external organizations in order to provide its end services to its customers. In this context, expectations of the IT service provider are negotiated with the external organizations and underpinning contracts are signed for the agreed service levels. It is cleared in any ITIL foundation training that ITIL Service Level Management cannot take place without full collaboration between the business, the IT department, internal parties, and external parties. There are many documentations and process that need to be followed to enable this collaboration and all stakeholders need to be completely on board. Fully committed IT service managers are required from the IT department’s side and the stakeholders from the business, internal parties, and external parties must be selected to have both a basic understanding of IT services as well as a sufficient level of commitment to keep collaborating on the project. 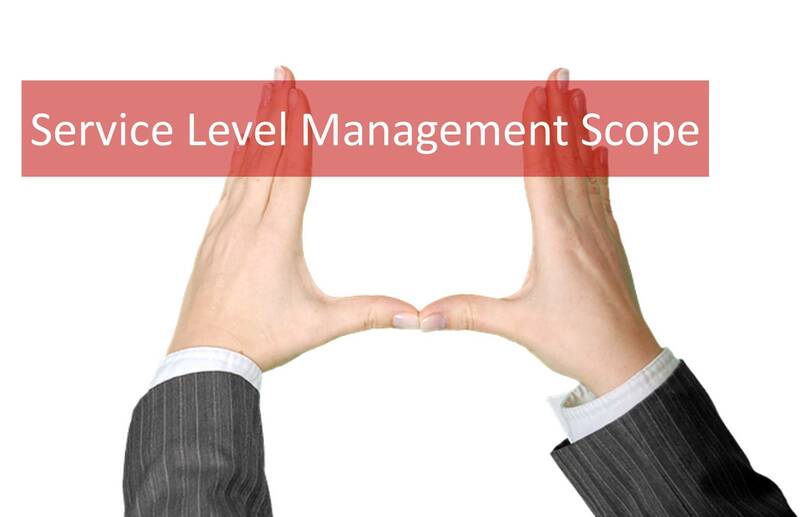 Understanding what is in the scope of the ITIL Service Level Management process is critical to enable efficient and effective handling of the SLM process. The IT service manager must be able to effectively negotiate regarding resources and capabilities needed for existing, new and upgraded services. He must also be able to effectively communicate in order to fully understand and manage the business’ expectations from the IT department and to establish that crucial link between the IT department and the business.